Welcome to the 43rd episode in our podcast series that’s about investing in tax-delinquent real estate specifically, but we also cover other REI strategies as well. In our business, we focus on properties where the owners have not paid the property taxes. As a husband and wife investing team, we’ve done nearly 3,500 deals – in land and houses – with little competition and big profits. And we’re letting you in on how to do it all. Today’s episode is about going shopping – because it’s tax lien time and action sales are popping up, yay! So, we’ll talk about different exit strategies when dealing with tax liens at auctions and how to choose the right exit strategy. We’ll also touch on bidding at auctions… and something that’s critical to making money, not losing it – we’ll cover red flags to watch out for that should steer you away from certain deals. Lots of good info in this episode. Jack: Hello everyone. This is Jack Bosch speaking. Jack: And, welcome to another episode of the Forever Cash Podcast. We’re excited to share with you today that it’s tax lien time in a lot of states around the United States. Michelle: Yipee! And that means that there’s a lot of sales going on, that are starting to pop up and it’s time to go shopping. Michelle: But because I love shopping. Jack: …But she loves shopping for the right things. She doesn’t go shopping… She doesn’t love shopping for like expensive shoes. Now she does like those too but for many of these typical things. But she loves shopping for tax liens, she loves shopping for land, she loves shopping for houses and that is wonderful because with every time she walks, we make money. Jack: Doesn’t that…? I mean that is turning the thing around and turning the typical stereotype around and showing that shopping can be very profitable. Jack: So, thank you for that, Michelle. Jack: Good. So now what we are going to talk about today is we are going to talk about the tax liens. Michelle: Yes, and basically we want to like I said, tax lien sales are popping up everywhere and we want you before you go and invest on tax liens, we want you to have or think about the two possible exit strategies that are out there and number 1 is are you… and you need to ask yourself basically a question, “Am I a person that has extra money to park?” and if that is the case and the answer is yes, then one of your exits will probably be to go ahead and invest on the actual tax lien certificate where you see that those properties more than likely will have a big chance of getting redeemed because what you are after is the redemption that will include basically the taxes and penalties and interest that you are bidding on at the tax lien sale. So that is number 1, exit; number 2 is maybe what you are after is you are after the actual property and in that case you will go ahead and invest on properties where you more than likely will have to go through and fall through the foreclosure process to actually acquire the property because these properties more than likely will not get redeemed. 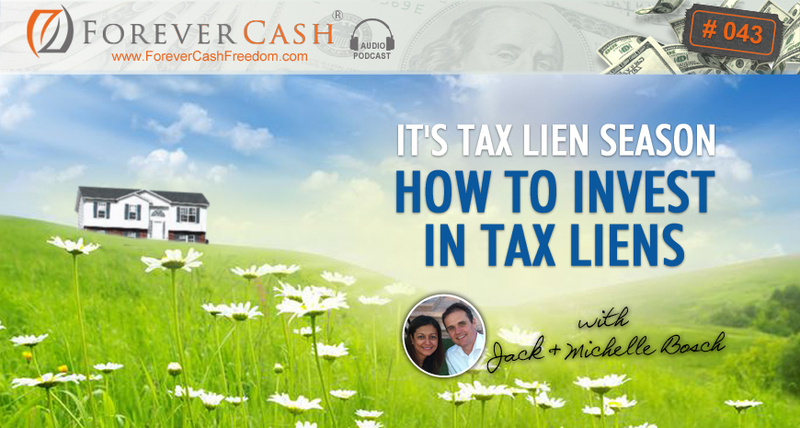 So we will walk you through steps on this podcast today of a little bit on how to differentiate between the two and just generally how you should prepare to go out there shopping right now in one of the highest times of the year for tax lien sales. Jack: All right, wonderful. So guys, tax lien, just to go take a quick step backwards, tax lien is when the government, when somebody hasn’t paid their property taxes and the government basically says, “Hey, I want my money,” so on every piece of property in the United States there’s property taxes assigned and if somebody doesn’t pay them, the government has two options. And usually they can choose one or the other except for a couple of states, but in more states that is written in the state statutes which option they have to take. And in about 25 or 50 states, the option that they have to take is that they can’t just take the property away, they can’t send the police to the people and they can’t raid your bank account. Somebody else says, “I am willing to accept 14, 12, 10, 8, 6,” and so on or they go 1% ranges, doesn’t really matter. At the end of the day, whoever is still standing and willing to take it at the lowest interest rate then gets to pay that amount that the lien was for, and therefore they now get to accrue that interest and get to have certain rights in the property. Most importantly, there are two rights: number 1 is if the owner of that property does not pay the property taxes for a certain time period after that, then they will be able to afterwards foreclose on that property and therefore become the new owner of that property just for having paid the tax lien amount perhaps over a few years. Michelle: But that one is like I said, you need to have the money and not just the money but you need to be able to park that money for a period of time. And if you need that capital this is not a good thing to invest it in. If you need liquidity within a certain period of time, my recommendation would be no, but if you don’t need that liquid cash right there but you need to park it in and you want something better than what the bank is going to give you, for sure this is a good way. Jack: Awesome, and actually that applies for whichever exit strategy because once you bought the tax lien, there is no way for the… or there is almost no way for you to get that money back until one of these two things happens: either the owner pays back the back taxes and at that moment you actually get all your money back plus you get the interest rate, a very high interest varying between 8% and 36% around the country. You get that money annualized, you get that back but the thing is that those people don’t understand and that’s where Michelle’s point come from is that you do not get monthly interest rate payments. You accrue interest and if that person never pays, the owner of the property never pays the back taxes on a property; you accrue interest all the way to the point that you can foreclose, and then become the new owner of the property. So since you do not know just by buying a tax lien whether or not that tax lien is being redeemed in a month, in a year, in two years or never, it is kind of a little bit of a point that Michelle made again that if money invested in tax liens is money that you don’t… that you got to be sure that you don’t need in the next few months or even in the next couple of years. Michelle: Yeah. And there are things to look at when investing in a property that gives you an indication that property either more than likely be redeemed or will for sure not be redeemed. Jack: Exactly, and that’s the thing, so while you don’t know whether or not you get the tax, these tax liens are going to be redeemed soon or not. You can look at the actual underlying asset, the underlying property and that one can give you a big, big hint and a big, big pointer towards whether or not the property is going to be redeemed or not. Because let me ask you, what do you think is a higher likelihood of being redeemed in the next few months? The beautiful house in the suburb with a picket fence around the grass, the house nicely painted, like light in the evening and kids playing in the front yard or the house that is completely boarded up, the weeds are six feet tall, there’s squatters living, it is a junk and nobody is taking care of that property for years? Michelle: Maybe that, maybe even the owner is out of state. Jack: On top of it, the owner is out of state, exactly. So which one of those is more likely that the owner will come, “Oh, my God, I forgot to pay the property taxes, let me go pay them”? Obviously the nice one, right? So therefore, if your interest is in the interest that kind of doubles it, if your focus is the interest versus your focus being the property… So if your focus is the interest, then you want to focus on pretty properties and if your focus is getting the actual property, then your focuses should be land as well as ugly houses, right. Michelle: I think Florida, Oklahoma, some other states, yeah. Jack: Yes, right, right. Florida has it monthly, but a lot of other states have it in the beginning of the year. So what you want to do now is you want to get ready for the auction and what you want to do there is… We have a detailed podcast in one of our first 5-6 podcasts about that but I do want to, because it is timely right now, quickly run you through that again in just a few steps and want to keep this a short podcast today. And number 1 you want to make that decision about whether or not you want to be in the interest game or in the property game. You want the interest or you want the property, because based on that as I just mentioned you focus on one or the other kind of property. Once you have made the decision, you want to choose a state to operate in, and within that state you want to choose a county to operate there. You want to make the decision on or you want more rural properties. Do you want city properties? Right, those are all the sessions that are like your preferential style of investing, then you want to basically get that list of upcoming tax lien properties. And first of all, you want to focus, you want to look at how much money do you have to invest into it. As we said already, you want to make sure that not all the money that you or all the money that you invested in tax liens might be locked up there for years. However, when you get it back, you get it back with a lot of interest or you get the property. But knowing that, you want to look at your budget, how much money do you have, and then based on that budget your goal is now to identify an amount of properties about probably 2 or 3 times as large as your budget, because again you are not even going to get every tax lien that you want to buy, there is a petition out there, there are lot of people bidding on it and so on. So if your budget is let’s say $10,000, and then you are going to see that the average tax lien is $1,000. Well then, you probably want to pick 20 to 30 properties because they have enough. With that, you have enough volume to then spend your… or invest your $10,000 and not end up with extra money in your pockets. But at the same time, you don’t need to do research then on 500 properties, 500 records. That would be a waste of time. Jack: And then depending on the outcome that you want, you pick properties in your value range. I mean it’s also a preferential kind of thing, do you want to pick 3 big commercial properties and have a $10,000 tax lien on them or do you want to pick $10,000 properties or you want to pick $300 properties? Michelle: When he talks about $300 properties, we are talking about the actual property tax amount that is delinquent, yeah? Jack: Yes, yes, yes, absolutely. Michelle: It is not the actual assessed value of the property or market value of the property. Jack: Exactly, so with that, thanks for the clarification. That’s really helpful. You obviously… I don’t mean properties worth $300; I mean properties with a tax lien that’s $300, and a tax lien is always a percentage of the property value. If you have a property, if you have a tax, one year’s worth of property taxes are usually anywhere between 1% and 3% of the assessed valued of the market value of the property, so you have a tax lien of $3,000 while it could be worth anywhere between $300,000 or $100,000 depending on which state you live in and so on and so forth. Michelle: The addresses of the owners, are they living there or not? Jack: …And the addresses, right. Look at as if the owners are living there. That’s a great candidate if you’re looking for the interest. If the owners are not living there, that’s a better candidate to actually get the actual property. And the last but not least, you schedule a drive through or you have somebody drive by the properties to make sure that they are actually still there. If there are houses, it’s not the first time somebody would go buy a tax lien on a property that burned down last week. And then you have that information, and then you create your list of your preferential properties you want to buy and you attend the auction; that is really as simple as it is not doing your homework. You have checked on these things, the last thing though you really want to do is you want to get down to the county or go to the county recorders index and check out the title of those properties. You do need to check if there is anything like IRS liens or any other government liens on those properties and the way you do that is you go to the recorders index you often call the guarantor/guarantee index and you check out again for any documents that are recorded against the properties that you have on your shortlist. Now that might take you another couple of hours to do this. But the point is it is time very well spent because it saves you from the risk of bidding on something that has a big government lien on it. Now why is that important? It is important because the government lien, all liens when you buy a property and you end up foreclosing on them, all liens are being wiped out so if there is a mortgage on it from a bank, if there is a mechanic’s lien in there from a contractor, if there is any other private liens on there, even HOAs, they are wiped out. However, what are not wiped out are any government liens, the government basically devised the process to flush these properties out but they didn’t want to step on each other’s toes. And therefore they didn’t want to wipe out liens that offer other government agencies. They would hurt themselves, so therefore these liens stay on there. So if there is an IRS lien on there, especially a county city or street assessment, they all stay on there. So your last check before you bid on the properties is to make sure that you are not bidding on something that let’s say… horrible example here, but let’s say there is a property that you identify with a market value of $80,000, has an $800 tax lien. You get excited about it, you go buy it, and then you realize that this property has a $120,000 IRS tax lien on it. In this case, you are now responsible for this $120,000 tax lien which means you will never foreclose. You are now responsible. Let me say that the property has that $120,000 attached to it. That means if you ever foreclose on that property and you become the owner of that property, then you would be responsible for that. You would inherit that IRS tax lien. By buying the lien, you are not responsible for it but by foreclosing on the property you would be. As a result, you just spent $800 and you will never initiate that foreclosure. Jack: So you just wasted $800 if that happens. So therefore, as Michelle said, it’s very well-spent time in looking to see if there are any government liens against that property. Michelle: And one last thing is when you decide and you pick the county, make sure you go to the county website or the county tax collector and get all the instructions on how to bid on those properties. They will probably have a detailed list, they probably want you to register, they are going to give you a bidder number. Some counties might even ask for a deposit up front, and so you want to make sure you take care of all of this before you even start doing research and going out there and spending money and bidding on properties. For sure, you need to find out all the details. Jack: Absolutely, because when you a buy a tax lien, you are paying for it, and then your money is gone. And you have a lien and that lien could be worth a lot of money and if you buy that lien on a clean property, you are going to get your money worth at the very minimum with a very nice interest rate, if you are lucky, with a $1,000 or $10,000 percent return because you buy something with 3 years of tax liens and $1,000 each plus foreclosure cost that is worth $100,000. You spend 5 and it is worth a 100. You can make your money 20-fold over in this kind of scenario. But if you buy a dirty property, if you buy a property that has these kinds of issues against them, you lose your money so therefore that research is very, very crucial. Jack: So with that, that’s really… now you go bidding. Now I hope we didn’t scare you with that last part, it’s just a little precautionary thing. Michelle: Certain precautions, yeah. So go then happily shopping. Michelle: Yeah, every dollar is like a little soldier and it goes out there and brings more soldiers back. Jack: That’s right. That’s from Shark Tank, Mr. Wonderful, right? Jack: He said we love the show Shark Tank and in that show Kevin O’Leary as he said, that this is how he looks at money, not that it is a little brutal way of looking at it but at the same time, it illustrates the point very well. You just sent your army of dollars into the tax lien war to come back to you unharmed with lots of extra soldiers, dollars as soldiers in addition and to increase your army size. And that’s a wonderful way to make money instead without actually even harming anyone, by actually just helping the government get the money that they have in the laws right for, right? So with that, thank you very much. Jack: And we will talk next week. I even mentioned there’s always our podcast notes. Forgot to mention, the podcasts notes are on ForeverCash.com/Podcast. We would love for you to head over there; check them out. Also, give us feedback on iTunes, give us a writing. We would love to get a few more 5-star rating so anything you could do for us would be absolutely wonderful. With that, go and have a happy tax lien investing.